F/i began life in 1982 as Surfin’ Fuhrers, formed by the duo of Richard Franecki on Moog synth and Greg Kurczewski on guitar. Using a drum machine they played what Franecki describes as simple, very repetitious riffs, and this is what soon led to F/i. The band expanded to a trio with the addition of Brian Wensing on second synthesizer and F/i began to widen their horizons with noisier and more industrial music, though they were very much into Hawkwind and the more experimental elements of the Krautrock coming out of Germany. Next to come was Steve Zimmerman, who would be F/i’s equivalent of Hawkwind’s Dik Mik and Del Dettmar. Feeling that the Industrial/Experimental music was becoming tedious, F/i brought in drummer Jan Schober and began to explore a more Rock oriented style, leading to a noisy and Punk with electronics approach that could be described as a kind of Punky brand of Hawkwind. F/i released numerous cassette albums in the 1980s, and later reached a larger audience with a string of vinyl LPs on the Massachusetts based RRR Records label. The enduring legacy is that of the American Spacerock bands born in the 1980s, none would achieve the blissful annihilation of Blanga more than F/i, though through the years they would explore a gamut of styles including Space-Punk, experimental noise, and floating space electronics. 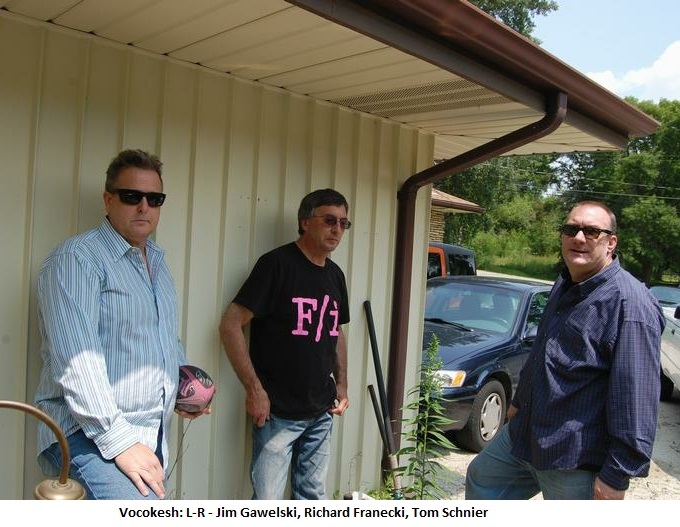 Feeling that F/i had morphed into too much of a conventional Rock band, having lost their experimental edge, Franecki left F/i in the early 1990s to form Vocokesh, who released several albums on the Drag City and Strange Attractors Audio House labels. Though quiet for much of the mid-late 1990s, F/i released the Helioscopium CD in 1997 and played at the 1997 and 1998 Strange Daze Spacerock Festivals. Franecki rejoined F/i in the early 2000s, releasing the A Question For The Somnambulist CD in 2002, and the appropriately titled Blanga in 2005. Which brings us to the present and a flurry of less than known activity in recent years. In September I posted an all Cary Grace special on Aural Innovations Space Rock Radio. Cary had briefly been a member of F/i and the inclusion of a track from 2015’s Venusian Holiday album garnered several stunned responses from F/i fans who assumed the band were inactive. In fact, both F/i and Vocokesh (the bands have shared several common members) continue to record, releasing numerous vinyl LPs on the Frankfurt, Germany based Pure Pop For Now People label, but also a few others that are noted below. Franecki explains that F/i never broke up, just went through periods of dormancy due to other projects the members have been involved in. Franecki has continued with Vocokesh and Wensing plays in Dr. Chow’s Love Medicine, who Vocokesh have opened for on occasions. 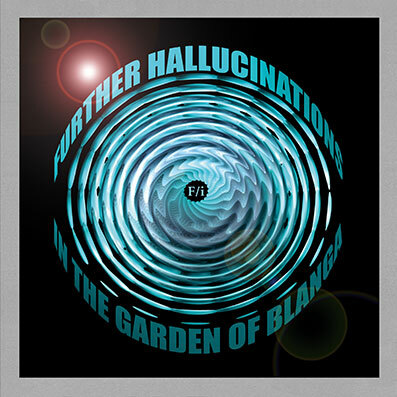 Further Hallucinations in the Garden of Blanga was released on vinyl LP in 2009 in an edition of 300 copies pressed on black vinyl and packed in a handmade heavy paper gatefold cover. The set opens with The Circle Is The Square, which sets the trademark F/i repetitive groove over which acid spaced out fun happens. The vibe is dreamily melodic, with one guitar playing trippy solos and the other cranking out corrosively ripping leads. And it’s all embellished by bubbling and bleeping alien synths. Shadow Vision is a short tune that sounds like the lysergic soundtrack to a Psychedelic Western flick, with phased and gurgling guitars that bring to mind a melting liquid audio Dali painting. The Hallucination Song is a free-wheeling mystical call to prayer with tasty acoustic guitar and flute. And those are the studio tracks. 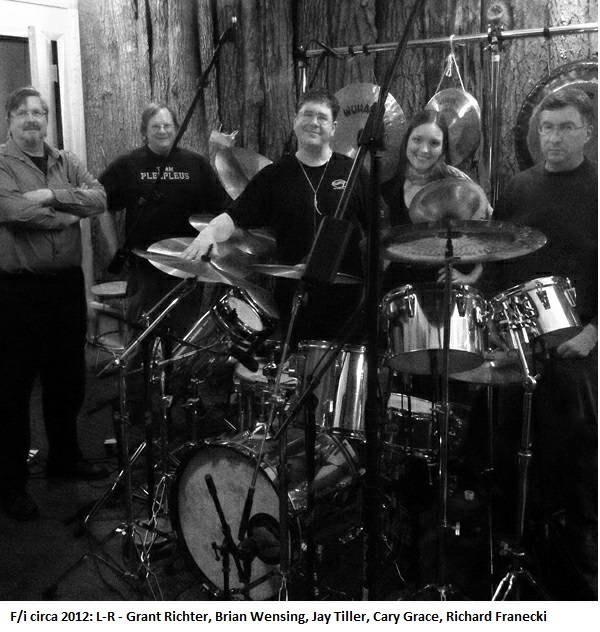 The next three were recorded live and include John Francovic from F/i’s Milwaukee homeboys Plasticland on bass. The Garden Of Blanga in The Morning Dew is a gorgeously melodic Psychedelic magic carpet ride, and once again we’re treated to cool dual guitars where one handles the straightforward melodic solo and the other being freakily efx’d. Throughout Side A we’ve largely been in sedately Psychedelic dreamland. But for the two lengthy Side B tracks F/i go full throttle for some balls-to-the-walls jamming Space Rock. In The Garden Of Blanga lays down a steadily propulsive rhythmic pace over which the guitars jam, with chunky noise-Metal chord blasts, corrosive licks and dark Gothic Psych leads. And the synths are front and center, blazing bee swarm trails of frenetically bubbling electronic waves. By the end we’re in full blown Space Rock ‘n’ Roll mode. Finally, Improvisation is precisely that… a chunky slab of jamming Psychedelic Space Rock. I like the steady but commanding rhythmic pace over which acid efx’d guitar slices and dices while the second guitar once again conjures up images of some kind of tripped out Western theme, and the electronics add a Hawkwind Space Ritual dimension to the proceedings. Both these suckers ROCK! But hell, I think you could dance to them! Veteran F/i fans might glance at this and wonder why I’m including such an old recording. 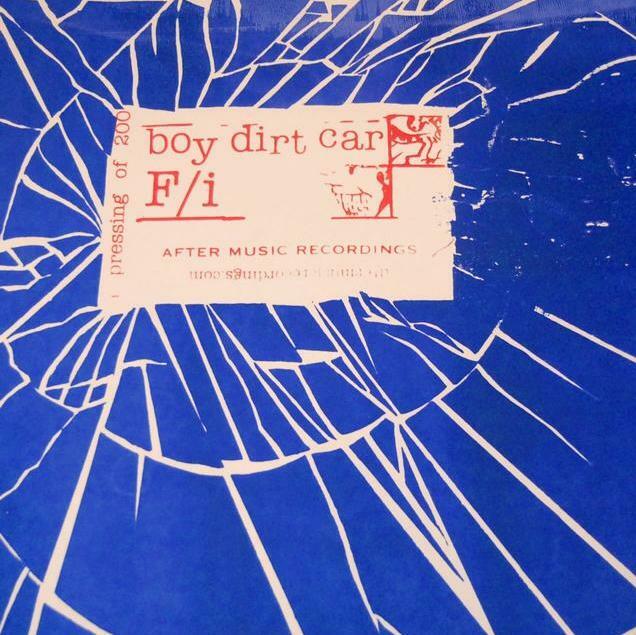 The first split with Boy Dirt Car was released by RRRecords in 1986, and for the 25th anniversary of that LP the Minneapolis based After Music Recordings label released these new recordings, pressed on blue vinyl in an edition of 200 and packaged in a simple foldover sleeve. F/i’s five tracks on the 1986 album opened with Union Grove 1 and closed with Union Grove 2 and this later effort recalls the original by opening with Union Grove (return), a brief introductory samples and sonic assault bit with smashes, bangs and clangs and some kind of sports announcement voice sample (F/i’s set closes in similar fashion with Union Grove (once again)). This leads into the nearly 10 minute An Answer to a Question Never Asked, a face melting stoner Space Rock dirge accompanied by fucked up voice samples plus sporadic and totally whacked electronic blasts. As the piece progresses the jam gets increasingly acid fried and the effects and manipulated voice samples morph and fuse with the music to create about as freak flag flying an experience as you can imagine. The brain-on-drugs motif continues with Jimi Hendrix at the Kennedy Assassination (dedicated to the late John Helwig who supplied the ‘Jimi’ riffs), which only differs with the overtly Hendrix guitar solos and some of the samples are from the… you guessed it… Kennedy assassination news reports, as well as famous Kennedy speeches. Both these tracks together make for some of the most seriously mind-fucked Psychedelic music ever made and draws heavily on F/i’s experimental roots. I’ve never known much about Boy Dirt Car other than the F/i association, though looking at discogs.com they seem to have a sizable discography. The brief bio there says the band “were formed by Darren Brown and Eric Lunde in 1981 after the two young punkers met Glenn Branca at a Chicago noise-music festival”. Their side of this split LP showcases a band that is similar to some of F/i’s most experimental works, featuring interesting Industrial/experimental sound, noise, spaced out electronica and voice sample excursions and cut-ups. 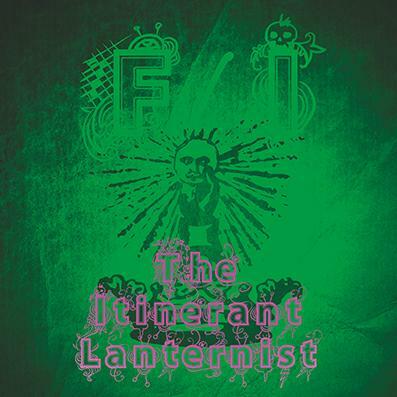 The Itinerant Lanternist was released on vinyl LP in 2014 in an edition of 200 copies. The lineup at this point included a new member: Cary Grace on theremin, electronics and organ. Cary is an American musician who now resides in the UK where she records albums of her own music and makes her living building synthesizers. The set kicks off with the acoustic, tribal and trippy alien inflected Fade To Orange, before launching into OnOff, which features F/i’s trademark brand of down ‘n’ dirty Space Rock ‘n’ roll, with grunge-fuzz guitar chords and whirring and screaming electronics. The band shift to a cool and strange combination of mystical Psychedelic and nasty doomy edged mode on the 10 minute A Medley Of Kaleidoscopes. Ominous fuzz bass and freakout Psych guitar are offset by jamming acoustic guitar and melodic flute to create a disorienting blend of free-wheeling moods and styles. Fade To Purple is like a mystical take on Hawkwind’s Space Is Deep. F/i keep things varied, interesting and fun by next launching into the bubbly gurgly fuzzed out high intensity Psychedelic freakout jamming Gazing At The Nothing Box. Incense And Kerosene takes the music into full blown Eastern alien mode with sitar, soundscapes and sci-fi electronics. Finally, Keep The Third Eye Open is a spacey dreamy jamming tune that closes the set. Dig that eerie soulful organ melody. Lots of killer variety on this one! 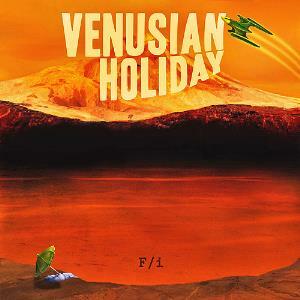 Venusian Holiday was released on vinyl LP in 2015 in an edition of 300 copies pressed on red vinyl by the (also German) Krauted Mind label. The title track opens the set in total Hawkwind Space Ritual freakout mode, which trips out in space for over three minutes before launching into the kind of stoned but high intensity Psychedelic Space Rock dirge that F/i have effectively patented over the decades. I love the simple but melodic bass riff and steady drumming that lays the foundation for the dual guitars to crash, burn, scream, moan and wail while the electronics bubble, gurgle and soar. It’s dirty, chaotic, and it absolutely freakin’ ROCKS out in space. All those Acid Mother’s Temple fans that buy the dozens of albums they put out each year should turn their attention this way for a genuine master class. Welcome to the Jewelled Forest is next and quickly lays down an energetic, repetitive rocking pulse with the bass playing a guiding lead that allows the volcanic and monster fuzzed guitars to scorch and sizzle everything in their path. There are some quieter interludes where the synths and electronic explore while the guitar cranks out ripping leads, though these gradually build back up to frenzied levels of acid-space fried intensity. 860 Degrees in the Shade is the one short track of the set but it’s a pummeling rocker that’ll leave you bruised. Finally, the 15+ minute Om 17 kicks off with a combination of bouncy guitar strumming, whirring synth and spirited beat, which is soon joined by additional spaced out synth and electronic embellishments that noodle and groove merrily like some lightly tribal dance around the burning man in space. The guitar and rhythm gets increasingly chunky until a little past the halfway mark when we go into a mélange of floating synth soundscapes, 50s sci-fi flick effects, Space Ritual guitar and freeform drumming. And then BOOM! !… we’re off in classic space rocking F/i land for the remainder. Cosmic Assassin is F/i’s second album of 2015 and was released on vinyl LP by the (yet another German) Psych KG label. There are two flavors: One is a numbered edition of 100 pressed on translucent blue/black/white splattered vinyl and a plain handmade cover with very cool pencil drawing art glued to the front. The other is a numbered edition of 30 that comes in a handmade wooden box and includes the LP plus a lathe cut 7″ with two additional songs. I’ve got the LP version. Several Brief Moments Of Stasis comes roaring out of the starting gate in acid fried Space Rock mode, with noise angst guitar, shimmering licks, rocking leads and corrosive metallic fuzz chords, plus whirring electronic swarms, all blazing along to a steady plodding march beat that serves the time tested duty of carrying the cacophony along on its shoulders. Zombies In The Mechanism is a noise clatter, sound exploratory, horror show atmospheric glom of experimentalism, the likes of which veteran F/i fans will be familiar with. This leads into Memories Of A Journey, which is a multi-layered brew of sci-fi sounds, soundscapes, effects and mission control voice samples that are anchored by interweaving hypnotic bass and guitar melodies. F/i excel at sheer spaced out chaos that nonetheless rolls along in rockin’ linear fashion. The riffage on the appropriately titled Galaxy Of Blanga To Telepath Zero immediately brings to mind Hawkwind’s Magnu and rocks hard as if it were a noise and fuzz-laden cover of that song. And the title track wraps up the set as a scorching Punk-Blanga fuzz rocker dominated by an incessant onslaught of hauntingly spaced out guitar licks with killer effects and squalls. 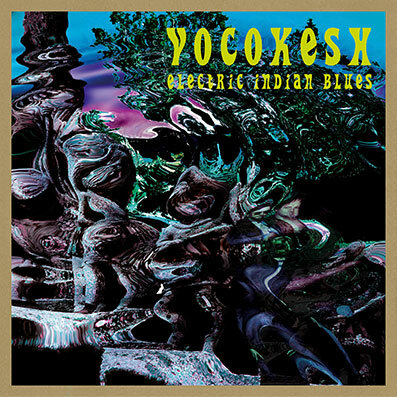 Electric Indian Blues was released on vinyl LP in 2009 in an edition of 200 copies pressed on black vinyl and packed in a handmade heavy paper gatefold cover. Dedicated to the memory of Klaus Dinger, who at the time of this album release was recently deceased, the album is one continuous spacecraft journey to the East. Psychedelia does not get any more trippy and spaced out than this. Meet Me At The Zone is a short warm up that pulls out the hookahs and Psychedelic snake charmers for a cranium searing sitar and acid guitar jam. This leads into the considerably more sedate but equally tripped out exploration that is Ode To A Lost Cause, which features slow burn Psychedelia and spaced out soundscapes that teeter mid-ground on the Acid-Psych/Space Rock axis. The ultra-bubbly liquid trip guitar sounds very cool against the deep space drift and easy paced stroll of the rhythm section making the journey a big ‘ol cosmic bong load of fun. And the gift keeps on giving with The Mummer’s Lullaby which includes electronic contributions from F/i’s Grant Richter. The label should be required to distribute drool buckets with each LP purchase because fans of wigged out acid-space guitar soloing and freeform brain fried chaos will surely need them. Lullaby indeed… just dig that hypnotically corrosive guitar. The sitar on the title track takes the trip into Eastern realms for more mind melting magic carpet ride, and the 14 minute Come And Have Some Tea fires up an even fatter one for a gently paced ride that’s all about the BURN! Acid sting guitar licks burst alongside spaced out buzzing synth waves and boiling cauldron electronics for a glorious glom of unadulterated mind-fuckery and acid drenched Space Rock. There ain’t no beginning, middle or end here folks… it’s all about the journey. Seeing It From The Other Side was released on vinyl LP in 2011 in an edition of 200 copies pressed on black vinyl and handmade cover similar to the Electric Indian Blues package. After the trippy grooving sitar-led Theme From “Get On The Train” fills the listening room with intoxicating smoke, the guitar takes front and center for the high intensity solo dominated Jam In “D”, which screams and wah’s at volume 11 while a lazy rhythmic pace adds a calming dimension to the Psychedelic potency of the lead guitar. Things take an abrupt thematic shift with Act 2, Eddie Plays His Theremin, which features guest Hal McGee on electronics and digital piano. Hal’s mad concert pianist rant sounds pretty freaky alongside the noise-angst Psych guitar and screeching electronic effects, and some of the bass riffs sound like they’re about to launch into a cover of Jefferson Airplane’s White Rabbit. A cool combination of Psychedelic freakout and abstract sound/noise collage. The title track resets the ship back on a caustic Acid-Psych course with another jam that features killer ripping leads supported by a second trippier guitar. It occurs to me that fans of the Bevis Frond’s more purely acid drenched adventures would surely leap aboard the Vocokesh train. The song title Joe Gets His Gun hints at the explosive Hey Joe “sorta” cover to come. Music For A Really Bad Spy Film does indeed have a soundtrack quality, starting off with trippily melodic dual guitars and then surprises by launching into a groovy Surf-Psych rocker. And Take The Slow Train closes the set with some sludgy stoned Doom-Psych led by the most agonizingly shrieking and volcanic guitar leads of the set. Monstrous finale! 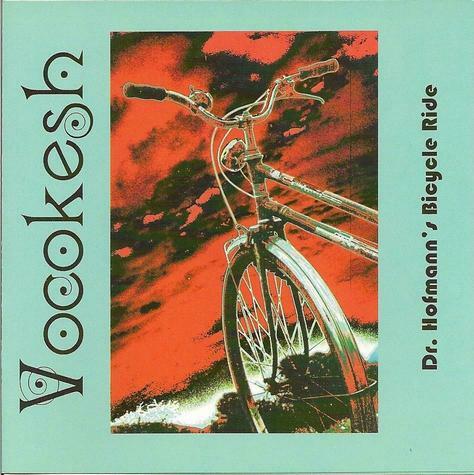 Dr. Hofmann’s Bicycle Ride is the one album in the article that I was already acquainted with. Released by the Italian based Phonosphera label, it was reviewed in Aural Innovations but by another one of our staff so I’ll include it here because it fits neatly in the timeline and as deserving of attention as the rest. Though it has its fair share of jams, Dr. Hofmann’s Bicycle Ride has several structured heavy Psych rockers too. The short but pleasantly paced Born Losers features trademark Vocokesh fuzzed guitar chords and slow trippy solos. Texas Asphalt Blues is similar though Valium dosed for an even lazier pace and includes screaming corrosive guitar licks over the slowly strolling melody. The spacey drifting The Cruising Song has a Pink Floyd-ish quality but with a drugged acidic vibe. Actually it reminds me of some of the songs on Floyd’s Obscured By Clouds, and I like how it gets cosmically orchestral as the music develops. Pretty Acoustic Piece is precisely that, being a meditative, spaced out acoustic guitar and synths floater with trippy Bluesy guitar plus rising, falling and fluttering alien electronics. Very nice. At the other end of the mood spectrum is the stoned doomy The Highway Song. Love those freaky demonic dual guitars. And we’re treated to more wild and wooly electronic action on the totally trippy 1000 Pictures In One Word. We’ve also got two lengthy stretch out jams. The 11 minute Kesh #10 is noted as being an improvisation. I like the spacey but dark atmospheric vibe with Gothic bass runs and ripping acid-fuzz guitar licks and the whole stew sounding like a bubbling cauldron that’s settled in for one big slow burning mish-mash of lysergic disorientation. And the 15 minute title track ends the set on a Psychedelically ominous note, having a bit of a Set The Controls For The Heart Of The Sun feel, though Vocokesh are completely freeform throughout. It’s a gradual trip in space, with buzzing and droning extended guitar lines and roaming bass, as the drums alternately solo and set a rocking beat. It’s all free-wheeling atmospheric noodling for your HED, though in the last minutes the band settles into a liquid Space-Psych Blues theme that carries through to the close. 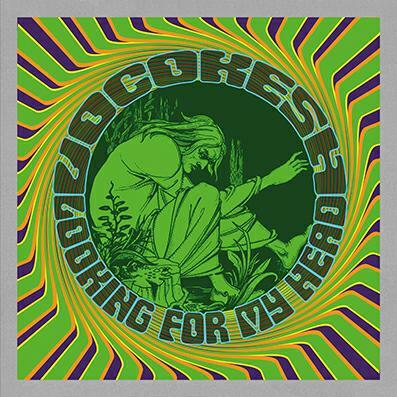 Looking For My Head was released on vinyl LP in 2012 in an edition of 300 copies packaged in handmade covers with 4 different sleeves at 75 copies each. It is also the last of the recordings to include guitarist/bassist John Helwig, who passed away suddenly from a heart attack in early 2011. Variations On A Familiar Theme opens the set full throttle as a raw, near Metallic slab of noisy Psychedelic Rock ‘n’ Roll played to a steady F/i styled rhythmic pulse that showcases thunderous slash and burn guitar. The soloing Psych guitar continues on the 11+ minute 9 Miles Under, though we ease back just a wee bit on the intensity for a cool grooving jam that features a tasty combination of ripping liquid Psych guitar and fuzzed punky bass. But these guys can’t resist blasting off and as the jam progresses the guitar takes on a Hendrix gone noise freakout quality with licks that shred off the fretboard, letting out agonized howls as they soar out into the stratosphere. 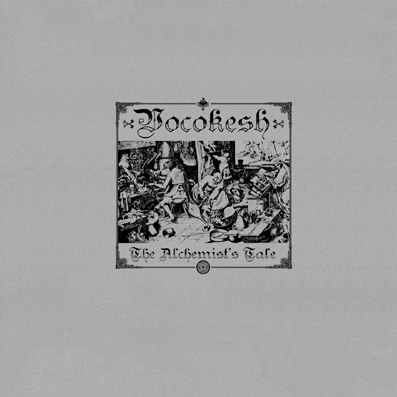 The second Vocokesh album of 2012, The Alchemist’s Tale, was released on vinyl LP in an edition of 300 in handmade cover packaging. After a brief Punk intro, Base Metal Blues launches into the rawest of the raw garage Blues-Psych guitar led jam, which is an energetic warm up for the 10 minute, more than appropriately titled Doing A Slow Burn. There’s a nasty Psych-Punk attitude and general No-Wave vibe that permeates throughout as the guitar trips about wildly, like some kind of Guru Guru meets Helios Creed with its brain bashed in by a mallet vibe. This is so raw and dirty that the flesh is seared but the heart is still beating. The Fuzz God Awakens lays down a bouncier beat, showcasing guitar exploration that starts off lightly bubbling and quickly unbuttons its collar to go slowly freakout wah’d. It’s all about filthy dirty nasty on this album! The freak flag has been drenched in mud and gore, like Punks that have decided to drag the Hard-Psych years that preceded them into the No Future era. The Four Elements is a lengthy workout that starts off in efx’d Space Ritual mode before launching into a stoned to the gills jam that continues the raw Psych theme and adds bits of demonic Black Sabbath-isms gone Punk, but it’s also peppered with plenty of alien effects. Otto mit dem Barte is a short head scratcher with noisy acoustic Blues guitar, spaced out acid licks, tribal drumming and multiple competing voice samples in German. And The Philosopher’s Tone wraps things up with some tasty Ax Genrich in space Hard-Psych and congested Noise-Psych Rock ‘n’ Roll. If you like your Psychedelia nasty and totally free-wheeling with lots of no quarter guitar destruction, The Alchemist’s Tale is for YOU. 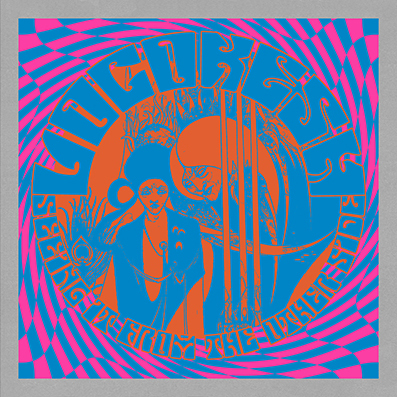 Think Guru Guru’s UFO and Hinton albums with a Punk and Noise-Psych infusion. TASTY! This 2014 album is a split with the band Krampuso (a side project of Boy Dirt Car’s Darren Brown) and released by the Minneapolis based After Music Recordings label. Not sure how many were pressed but it’s packaged in a simple foldover sleeve. The Vocokesh side consists of a single track titled Fantasy soundtrack based on the first 19 minutes of the film ‘Anticipation of the Night’ by Stan Brakhage. I Googled to find that it’s an experimental film from 1958 and can be viewed on YouTube. This is an interesting piece and very different from most of what I’ve heard from Vocokesh, though by no means a surprise to anyone schooled in the past decades of Franecki’s work. It does indeed have a soundtrack quality, sounding like an avant-garde theme building Psycho-Noise-Percussion bit of audio performance art. Rumbling guitar pulsations, noise-drones, piercing stabs and other sundry effects flitter and attack as noise and trippy factors interweave and compete. Past the 6 minutes mark the drums start to lay down a standard beat and the music gradually takes on a jamming quality, though it’s all still noisy and freaked out in a rhythmically grooving way. Eventually it goes full on Psych freakout Rock ‘n’ Roll with searing mind-fucked guitar and sitar and thumping Stoner-Punk bass before returning to a noise collage finale. Very intense. It would be fun to do a screening of the film with Vocokesh performing live. The Krampuso side is in a similar spirit, as if both bands were given the same assignment. But Krampuso sticks to an avant-garde sound exploration style, creating flowing streams of ambience, lightly rolling noise waves, atmospheric orchestral percussion, and clattering space excursions. Interesting stuff. 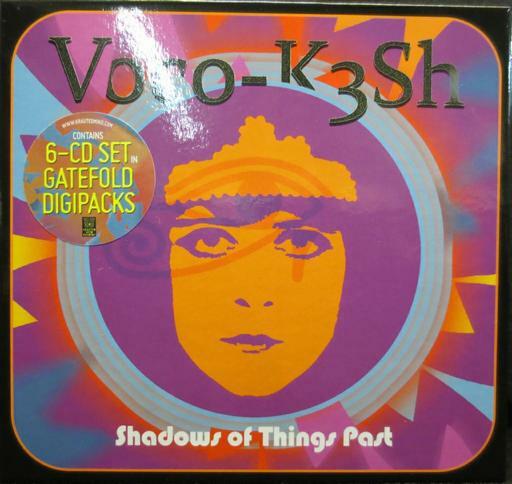 Shadows Of Things Past is a 6-CD box set released in 2014 in an edition of 300 by the German based Krauted Mind Records label. As Franecki explains in the notes, rather than being a retrospective or ‘greatest hits’ set, the music “represents different aspects of our work” from 2005-2013. The tracks on four of the CDs are not presented in any chronological order though there is logic to their placement. Many of the pieces are “jarringly different versions of pieces that were released elsewhere”. Two of the CDs are complete works unto themselves: Welcome To My Cloud had been scheduled for release a few years prior by a label that ended up going out of business. And Why Not Now?… Alan! is a Vocokesh re-recording/re-telling of the 1987 F/i album of the same name. So YES, a nifty package indeed! I won’t give a play by play of the four compilation CDs other than to say that Vocokesh fans will be thrilled. There’s lots of variety, being chock full of spaced out, acid fried Psychedelic jams and oodles of other goodies. And if you’re up to strapping yourself in for the long haul, some of them stretch out well beyond the 10 minute mark. In fact, this set is not only essential for seasoned fans but it would make the ideal introduction to the band for newcomers. It was fun listening to Why Not Now?… Alan! side by side with the F/i original. 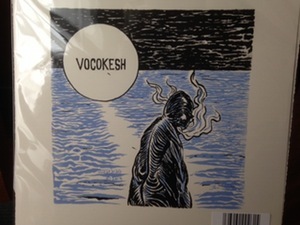 Vocokesh retain the same spirit on some tracks and take others in a variety of directions. The tracks line up except Vocokesh open with Why Not Now?… Alan! 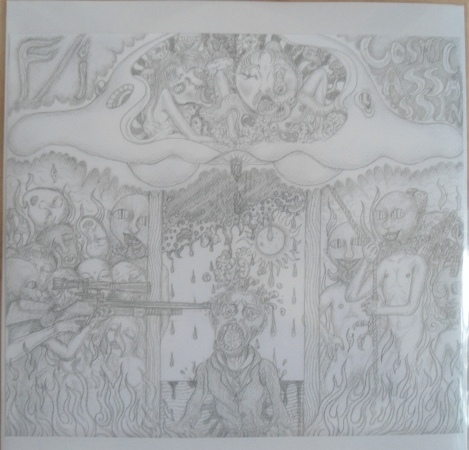 (Different Version), which starts off reminiscent of the freakiest space freakout moments of Hawkwind’s Space Ritual before launching into the recognizable Why Not Now?… Alan! riffage. The guitar is classic ripping and wailing Psyched out Vocokesh and the bass has a repetitive Can style that keeps the music driving along at a domineering pace. We later return to the opening freakout before shifting to an acidic Space-Doom theme that has a potent soundtrack feel. The robotic electro rocking groove of F/i’s Number 27 is similarly approached by Vocokesh (who call theirs Number 28), but it starts off more experimental sound exploratory, and when the rhythms kick in it’s got an avant-garde Can meets Sun Ra in Punk land feel. Vockesh’s Q(E)Z is very similar to the radio static, grating noise waves and angst guitar of F/i’s QR(Z). Nothing More Than A Hoax on the original begins as a clatterous glom of drums and miscellaneous percussion, guitar/bass crashes, electronic noise and news samples that gradually develops into a still clatterous but steadily off-kilter trademark F/i Space-Punk-Noise-Blanga rocker. Vocokesh hew closely in their interpretation and include lots of cool cavernous acid-noise guitar and crazy electronic effects. Whereas F/i’s Electric Waltz is a merrily swaying acid-noise Psych rocker played against a twisted single themed noise-drone symphony, Vocokesh keep the merry swaying groove while conjuring up images of a lysergic danse macabre. The title track was a highlight of the F/i set, striking me as something like Faust gone chaotic Noise-Industrial with an early Tangerine Dream injection. Vocokesh launch right into the principle rocking theme, making for a pure Vocokesh Hard Psych rocker and includes killer high intensity guitar crashing and soloing, with a cool slower Psychedelic throb jam sandwiched in the middle. Vocokesh’s Zombie Theme is on target with their slam bang percussive patterns and honking car horns that match up with F/i’s Zombie Theme 3. But then Vocokesh go in a different direction on An Observation. F/i’s An Observation: The Eye At The Top Of The Pyramid was a noisy, screeching, sci-fi efx’d, Space Ritualistic, acid drenched Space Rocker, whereas Vocokesh abandon the noise and (a measure of the) chaos for a balls-to-the-walls acid-Blanga anthem rocker. The other “album” in this boxed set is Welcome To My Cloud. Most of the 12+ minute opener, Tibet Blues, is an extended tension-laden buildup with a low end stoner fuzz bass lead which propels the acid sting and Psych-Metal guitar licks. Ghost Town Surfer is both ghostly and has a (slight) Surf vibe at the beginning, but also has a Grateful Dead jam feel, cosmic Blues, and even a touch of Jazz. A Nice Interlude 3 reminds me of Pretty Acoustic Piece from the Dr. Hofmann’s Bicycle Ride album. The dual trippy sitar and acid guitar soloing is killer on 1000 Words In One Picture, which is a variation on the flip-flop titled 1000 Pictures In One Word, also from Dr. Hofmann’s Bicycle Ride. Meditation 7 (Under the Blacklight) creates the audio equivalent of gazing at a lava lamp by combining shimmering soundscapes with hookah puffing weirdness, Forbidden Planet electronics and avant-Psych exploration. In Case Of Fire, Break Glass, A Slight Return and Welcome To My Cloud are similar bongloads of meandering mantra induced adventure with fuzzed, shimmering and snaking guitar leads, and the later showcasing 12 minutes of darkly atmospheric, spectral Space-Psych exploration with a colony of alien insect effects. You can count on this set for a solid hour of stoned lysergic navel gazing. A new F/i album is complete, to be titled Bastards of the Universe. The band are searching for an American label so if that’s you and you’re interested or know anyone who might be please note Richard Franecki’s email address below. Cary Grace continues to be a ‘long distance’ member of F/i and will contribute electronics to upcoming projects. Cary has produced an amazing body of her own work and if you’re not familiar with her I recommend CLICKING HERE to read the interview I conducted with her a few months ago. Vocokesh will be releasing an LP on Pure Pop for Now People later in 2016, title as yet to be determined. Psych Kg has agreed to issue a Vocokesh LP later in the year as well. Tracks and title still to be deteremined.